Tons of Christmas-themed workshops that will explore every facet of children’s creativity through arts & crafts and other self-expression activities. Inventory lists, a workshop planning chart, a follow-up booklet, and everything your group needs to get creative and prepare for Christmas! This week, the educatall team has created a series of creative workshops that you can enjoy with your group as you prepare for Christmas. For the most part, these workshops can be enjoyed both indoors or outside. You will find that this theme is packed with ideas to keep your group busy for days! 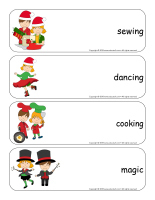 (Open thematic poster-Christmas-Creative workshops) Print, laminate, and display within your daycare where parents will see it. Pick a wall that can be used to display children’s artwork. You could, for example, write Christmas-Creative Workshops at the top. Make sure you use a wall that everyone will see, parents and children. You could also hang a simple indoor clothesline in front of your wall and use it to display drawings or other projects. Take pictures of the children in your group when they are busy being creative. Print them and display them on your wall, among their masterpieces. (Open stickers-Christmas-Creative workshops) Print the illustrations on adhesive paper and use them to create unique stickers. 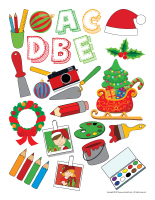 (Open educa-decorate-Christmas-Creative workshops) Print, cut out, and laminate. Use the items to decorate the walls of your daycare and set the mood for the theme. 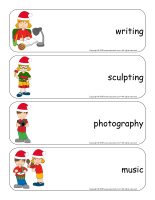 (Open educa-theme-Christmas-Creative workshops) Print and laminate the items that represent the theme. Use them to present the theme to your group (and parents) while decorating your daycare. The pictures may be used as a memory game or to spark a conversation with your group. Use them to decorate the daycare or a specific thematic corner. 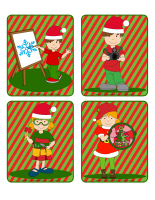 (Open picture game-Christmas-Creative workshops) Print, laminate, and store in a “Ziploc” bag or in your thematic bins. 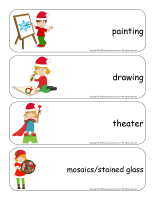 (Open poster-Christmas-Creative workshops-Painting) Print, laminate, and display to identify your workshop. (Open inventory-Christmas-Creative workshops-Painting) Print and insert this sheet in your thematic bin. Use it to inventory the contents of your bin. Add a variety of items such as: paintbrushes (different sizes), rollers, bowls, wooden sticks, platters, Christmas aprons, Christmas ribbons, elf hats, color swatches and samples, etc. Dress children up to make them look like artists. They can wear old shirts with paint stains on them. Hang large pieces of paper on the walls of your daycare and set an old bedsheet on the floor. Let children paint on the paper using different tools and colors. Encourage them to use bowls to mix colors or, if you prefer, provide real paint palettes or large Styrofoam meat platters. Simply cut a thumbhole out of each one so children can hold them like real artists. (Open planning chart-Christmas-Creative workshops) Print, laminate, and use with a dry-erase marker so you can use this chart year after year. This indispensable tool will help you prepare and create the material needed for the workshops you wish to offer. It will also simplify the organization of your environment and help you plan per children’s interests. What’s more, you can use the chart to assess and analyze the activities you present on a daily or weekly basis. 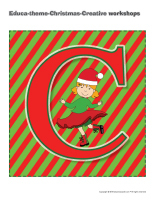 (Open follow-up booklet-Christmas-Creative workshops) Print for each child. This follow-up booklet will help you gain a better understanding of what children are learning in each workshop. Encourage children to explore paint with their fingers. Plan a workshop where children can mix two colors together (red and green) to see what happens. You can also provide them with the opportunity to mix two primary colors and explain how once they are well blended together, they will have created a secondary color (ex. blue+yellow=green). Variation: Have fun applying a small amount of blue paint to the tip of one of your fingers (or your entire palm) and applying a small amount of yellow paint to the tip of a child’s finger (or entire palm). Press your fingers or palms together to see green appear. Have children paint on colorful paper. Try to provide paint colors that will create a bold contrast. For example, use white paint on black or dark blue paper. Red paint will really pop when used on bright blue paper. Plan a workshop where children can paint on a variety of different textures. For example, painting on felt represents an interesting experience. Painting on tree leaves is another great option. You may also explore painting on pieces of wood or crepe paper. Body paint can also be tested as part of this workshop. During the week, offer different types of painting workshops. Children will enjoy painting with paint that has been somewhat diluted, with very thick paint, with textured paint (to which sand or salt has been added), etc. Jell-O paint (mixture prepared by adding a small amount of water to Jell-O powder) is always fun for young painters. Provide a different type of paintbrush each day: very narrow, very wide, etc. Provide sponges, rollers, cookie cutters, stampers, and cut squash. Children will love using these tools for painting. Of course, they can also use their hands (and even their feet)! Hang a large piece of paper on the wall and encourage children to paint all over it. You can have them try to paint with their back to the wall. They will find it challenging to paint without seeing what they are doing. Invite children to paint with their feet. To create their masterpiece, they will have to hold a paintbrush with their toes instead of their fingers. They can also press their feet in paint and then on the paper. With their toes pointing downwards, their footprints will look a lot like reindeer silhouettes. Enjoy a finger painting workshop. Provide tactile paper and several finger paint colors. You could even use snow! Let children paint freely. Plan a color combination workshop. (Open color combinations) Print, laminate, and display where children can see it. Provide glasses of water, food coloring, and small spoons. Let them try to create several different colors. Organize a bubble painting workshop. Add a few drops of food coloring to your homemade bubble solution. Have children create their own bubble-blowing tools using pipe cleaners. Set pieces of white paper on the table and invite children to blow colorful bubbles on the paper. Sit back and watch pastel designs appear. Plan a rainbow-colored workshop. Encourage children to use rainbow-colored waxed crayons on tactile paper. When they are done, have them paint all over their paper with black paint. Set their work aside to dry. Once it is dry, show them how they can use the wooden tip of a paintbrush to scratch the paint and reveal the rainbow colors. In this workshop, children will explore colors. (Open picture game-Colors) Print, laminate, and cut out the cards and set them face down on a table, in rows. The first player turns two cards. If they are identical, he may keep them and play again. If not, he must turn them over and his turn is over. Make sure the other players were given the chance to see the colors. The object of the game is to find the most pairs. Prepare the necessary material for a workshop in which children will have fun painting on fabric. Encourage children to paint on pillowcases, a sweater, felt, etc. Invite them to paint a Christmas-related character or item. For this workshop, you will need small pieces of wood that are lightweight. Use a drill to create a hole at the top of each one, big enough to thread a ribbon or string through it. Let children paint freely on the pieces of wood. These creations will make great Christmas decorations or gifts. This creative workshop requires paper plates. Have children paint the paper plates. Once they are dry, use them to create a garland that can be hung in your daycare. Provide several different paint colors as well as a huge piece of cardboard. Let children use paintbrushes to paint on the cardboard. They can mix colors to create spectacular Christmas fireworks. Window painting workshop. Let children paint on your daycare windows using paint that you have diluted with a little water and dishwashing liquid. When they are done, use scrapers to remove the paint. Freeze red and green paint in ice cube trays. Insert a wooden stick in each section. Children will love painting with these homemade paint blocks. Let them use these unique painting tools to express their creativity. For this workshop, you will need clear document protectors. Separate each one so you have two sheets. Let children paint on them. When they are done, use a moist washcloth to wet the back of each sheet (unpainted side) and press them on a window. If you wish, you could have each child press his hands in paint and then on a clear plastic sheet. Plan a sweet painting workshop. Have children mix sugar with several colors of powdered paint. Divide the colors among several empty dishwashing liquid bottles. 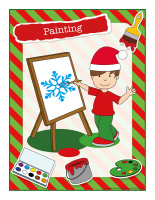 Children can draw Christmas designs on a paper with white glue and have fun squeezing the sugar paint all over. Organize a water paint workshop. Have children choose between red or green tissue paper. 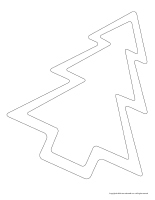 Have them draw a Christmas tree outline on the tissue paper, cut it out, and set it on a piece of white paper. Encourage them to delicately “paint” the tree with water. When they are done, gently remove the tissue paper tree. The ink from the paper will have stained the white paper. Plan a Christmas-themed painting workshop. Prepare Jell-O paint with your group by adding a small amount of water to the contents of a few boxes of red Jell-O powder. 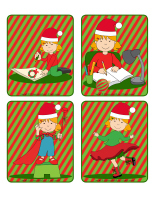 Have each child select a Christmas coloring page (or they can use white paper if they want to create their own designs). Let them use the Jell-O paint to add a touch of color. They can even lick the paint off their fingers, it’s completely edible. 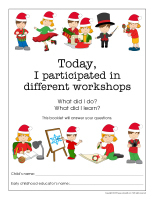 (Open poster-Christmas-Creative workshops-Drawing) Print, laminate, and display to identify your workshop. 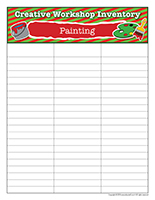 (Open inventory-Christmas-Creative workshops-Drawing) Print and insert this sheet in your thematic bin. Use it to inventory the contents of your bin. Add a variety of items such as: crayons, chalk, markers, notebooks, chalkboards or dry-erase boards, stamps, stamp pads, papers, pens, stencils, Christmas coloring pages, etc. This workshop is simple, yet fun. Let children use crayons to draw on a variety of surfaces such as a large cardboard box, paper plates, paper, cardboard, a chalkboard, etc. Hang a large piece of paper on a wall and invite children to draw on it. Set a large piece of paper on a table and encourage children to stand around the table to draw on it. Outside or in a hallway, set large pieces of cardboard here and there (propped up or simply set on the ground) to provide children with new surfaces to draw on. Focus on one color at a time. Provide different types of crayons and pencils, but all in the same color. Invite children to draw on Christmas-themed paper. Display their work on a wall. For this workshop, set up your material in a way that encourages children to work as a team. For example, hang a single piece of paper on a wall. You can invite children to work with a partner by setting a single piece of paper on a table for two children. Very young children can sit in their highchair. Set a piece of paper and crayons on their highchair tray. Have children sit in a circle. Give one child a piece of paper and crayons. Invite him to draw on the paper while you play Christmas music. When the music stops, the child must stop drawing and hand the paper and crayons to the child sitting next to him. This second child continues the drawing until the music stops again and so on. The result is always fun to see! For this workshop, provide Christmas papers and crayons. Set a timer for 5 minutes. When you say “go”, children begin drawing. When the timer rings, they must stop drawing, even if they are not done. Let each child present his drawing to the group. Plan an “opposites” drawing workshop. Have children draw on black paper using white chalk. When they are done, have them reproduce their first drawing using a black marker on white paper. Print several Christmas-themed coloring pages in the educatall club and let children color them freely using waxed crayons, wooden coloring pencils, markers, etc. I can draw myself workshop. Provide a face outline for each child. (Open face outline) Hand children mirrors they can use to notice their facial features and help them draw their eyes, nose, mouth, etc. Mandalas foster concentration. You will find several Christmas-themed mandalas in the educatall club. Print the ones you prefer and set the on a table. Children can color them whenever they feel they need to relax. A workshop to help children understand if they are righthanded or lefthanded. Begin by showing children how they have a left hand and a right hand. Ask them to draw something using their left hand and then with their right hand. You may use two pieces of paper per child or divide one sheet of paper into two equal sections. Write on each paper or section which hand children used to draw. Organize a silly workshop where children must use a different body part (other than their hand) to draw. They may use their toes, their knee, their elbow, etc. The results may surprise you! Set a large piece of paper on the floor and invite a child to lie on it. Trace the contour of his body. Cut out the shape and hang it on a wall. Let the child decorate his silhouette using markers, fabric, wooden colored pencils, etc. Plan a scented workshop. You will need scented markers that children can use to draw. Encourage them to identify the different scents. 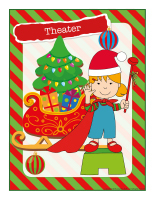 (Open poster-Christmas-Creative workshops-Theater) Print, laminate, and display to identify your workshop. 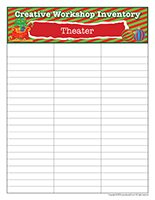 (Open inventory-Christmas-Creative workshops-Theater) Print and insert this sheet in your thematic bin. Use it to inventory the contents of your bin. Add a variety of items such as: old clothing items, wigs, hooks for hats, baseball caps, scarves, jewellery, costumes, baskets, etc. You can also create a special theater area using a large cardboard box. Paint and decorate it with your group to make it look like a stage. You may hang tiny Christmas lights in it. Add curtains and make sure there is a mirror nearby so children can admire their theatrical outfits and faces. You could have fun practicing a short play or acting out the lyrics of a song with your group. Theater is a great way to foster all aspects of childhood development. 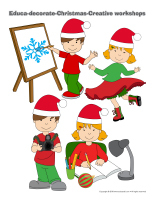 Encourage children to invent and practice a short Christmas show or play. Plan a workshop around mimes. Explain to your group what a mime is and invite them to pretend they are Santa Claus delivering gifts, walking like an elf, unwrapping a present, going up or down stairs, pulling on a rope, climbing a tree, etc. Explore shadow puppets with your group. Hang a large white bedsheet from the ceiling. Show children how they can represent animals (ex. a reindeer). They will have fun guessing what different shadows represent. You can use your hands or cut shapes out of cardboard and glue Popsicle sticks or wooden skewers behind them to make holding them easier. Provide face paints and makeup and enjoy a Christmas-themed face painting workshop with your group. Encourage children to team up with a friend. They will have fun painting their partner’s face. Giant puppet workshop. Divide your group into pairs and give each child a large piece of paper. Have children take turns tracing their partner’s silhouette using waxed crayons. When they are done, have children decorate and cut out what will become giant puppets. Display them on a wall. Improvisation workshop. Depending on the ages of the children in your group, explore short sketches children can act out. This workshop can also be used to explore emotions. Role play workshop. Set an easel, a paint palette, a few paint samples, coloring pages, and paintbrushes in your theater area. Add a beret and a scarf that children can wear. They can take turns pretending they are well-known artists. Encourage them to create Christmas-related masterpieces. Let each child present his work to the group. Collect all the musical instruments you can find. Set up a microphone and encourage children to play music to accompany a simple play (or song) that they are acting out. Elf parade. Have each child wear an elf hat. They can also loosely wrap a Christmas garland around their neck. Paint their cheeks and the tip of their nose with red makeup pencils. Give each child a musical instrument and have fun parading throughout your daycare or neighborhood. Don’t forget to take pictures! 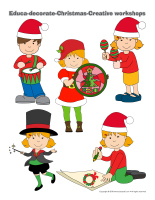 With very young children, simply set a hat on each child’s head, paint the tip of their nose red and have fun exploring musical instruments and Christmas music. Rudolph the red-nosed reindeer hats. (Open reindeer antlers) Print for each child. Glue the antlers on a construction paper headband for each child. Let children decorate their hat as they wish. Star-shaped glasses. (Open star glasses) Print the model and trace it on heavy cardboard for each child. Cut out the center of each lens and glue red or green cellophane paper inside each shape. Assemble the glasses. 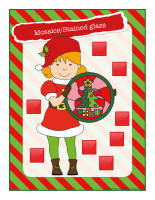 (Open poster-Christmas-Creative workshops-Mosaics/Stained glass) Print, laminate, and display to identify your workshop. (Open inventory-Christmas-Creative workshops-Mosaics/Stained glass) Print and insert this sheet in your thematic bin. Use it to inventory the contents of your bin. 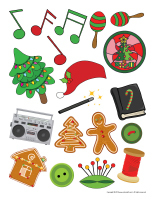 Add a variety of items such as: pre-cut shapes, stencils, Christmas coloring pages, stickers, Fun Foam shapes, etc. Be sure to provide very small and very big shapes so children can create miniature or giant mosaics. Christmas mandalas. (Open mandalas-Christmas) Print for each child and encourage your group to color the mandalas using Christmas colors. Children love stickers and will therefore enjoy this workshop. Purchase several different sticker books and set large pieces of cardboard on a wall. Let children use the stickers to create mosaics. Gather recycled materials children can use to create a three-dimensional mosaic. Have them glue the items on a large piece of cardboard (this activity can also be done outdoors). Plan a creative workshop where children represent a mosaic using Jell-O cubes. Prepare four packages of Jell-O using containers large enough for the preparation to be approximately 1 cm thick. Once the Jell-O is set, cut it into squares. For dessert, invite children to form a mosaic by arranging four Jell-O squares (different colors) on a plate. Serve Christmas cookies and milk with their edible mosaic. For this workshop, you will need several tongs (different sizes) and a variety of mosaic pieces. Invite children to use the tongs to pick up the mosaic pieces and set them in a container. They will develop their fine motor skills throughout this workshop. Cut several square pieces of tissue paper (different Christmas colors). Using “Mod Podge” or diluted white glue, let children glue the pieces of paper on clear paper, overlapping them. Let dry and display their Christmas mosaics in a window for everyone to admire. Visit your local hardware store to find paint samples. Cut them into tiny squares and use them to create colorful mosaics with your group. Collect several scraps of paper and cardboard that you can tear into pieces. Use the pieces to create a colorful mural with your group. Grate old waxed crayons, dividing colors. Have children sprinkle the pieces of grated wax on waxed paper. Cover them with a second piece of waxed paper. Use an iron to melt the wax. Cut Christmas ornament shapes out of the waxed paper and hang them in front of a window. For this workshop, cut a piece of adhesive paper and invite children to press different types of paper (tissue paper, cardboard, cellophane, etc.) all over. Press a second piece of adhesive paper over their work and display your stained glass in a window. (Open Christmas stained glass) Print and trace the shapes children prefer on heavy cardboard. Cut out the center of each shape, glue it on cellophane paper and cut it out again. Encourage children to apply white glue around the contour of the shapes and sprinkle them with glitter. When they are done, display their Christmas stained glass in a window. Cut a Christmas shape out of red or green construction paper and cut out the center of the shape. Glue a piece of adhesive paper behind the shape. Press tiny pieces of Christmas tissue paper on the adhesive paper. Display in a window. (Open poster-Christmas-Creative workshops-Writing) Print, laminate, and display to identify your workshop. (Open inventory-Christmas-Creative workshops-Writing) Print and insert this sheet in your thematic bin. Use it to inventory the contents of your bin. Add a variety of items such as: notebooks, chalkboards, stamps, stamp pads, chalk, pencils, crayons, pens, activity sheets related to the theme, etc. 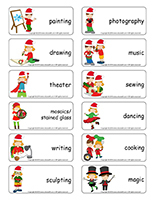 In preparation for this workshop, print and laminate the following document (Open word flashcards-Christmas). Set the flashcards in the centre of your parachute or on a blanket. Children hold on to the edges and when you give the signal, raise the parachute to send the flashcards flying in the air. As the word flashcards fall back down, children collect them and have fun trying to “read” the words. For this workshop, children pretend they are illustrators. Provide stamps, stamp pads, envelopes, boxes, wrapping paper, pens, rulers, bags, and pieces of cardboard they can use to create illustrations. Set old computer keyboards or typewriters on a table. During this workshop, children have fun pretending they are reporters typing their latest story. In your daycare, invite children to search for toys on which they see letters or words. Have them bring them to you one at a time. Help them identify the letters and words. Provide pens, pencils, writing books, stationery, alphabet stencils, and envelopes. Invite children to write a letter that they can later mail to the daycare or to their parents. You will need black construction paper for this workshop. Have children glue alphabet pasta all over their paper. Variation: If you wish to use colorful pasta for this workshop or to create a special manipulation bin, mix 1 pint of alphabet pasta, 2 tablespoons of food coloring, and 3 tablespoons of rubbing alcohol. Seal the container and shake to coat the pasta with color. Spread the pasta out on a baking sheet to dry for several hours. To plan this workshop, ask children to tear pictures they like out of a Christmas coloring book. They could also tear pictures out of old, damaged storybooks. Cut the text portion if you are using illustrations from storybooks. With your group, arrange the illustrations in a row, as you wish. Encourage children to invent the story that could accompany the sequence of illustrations. Write their text below each illustration. Photocopy the illustrations and the text and help children use ribbon to create a book. Send a copy of your group’s original story home with each child at the end of the day. Provide Alpha Bits cereal and invite children to use the cereal to represent words. Writing to Santa Claus. 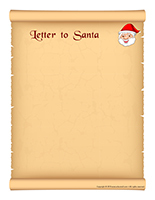 (Open model-letter to Santa) Encourage children to discuss what they would like Santa to bring them for Christmas. Provide catalogues and flyers and let them cut out pictures representing the toys they want. Have them glue the pictures on their letter. Mail the letters to SANTA CLAUS, NORTH POLE, CANADA, H0H 0H0. Remember to add your return address so that Santa can write back! Christmas writing workshop. 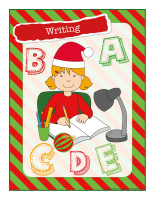 (Open writing booklet-Christmas) Print for each child and encourage them to complete their booklet during a very special Christmas writing workshop. 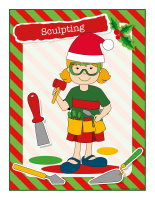 (Open poster-Christmas-Creative workshops-Sculpting) Print, laminate, and display to identify your workshop. (Open inventory-Christmas-Creative workshops-Sculpting) Print and insert this sheet in your thematic bin. Use it to inventory the contents of your bin. Add a variety of items such as: modeling dough, Christmas cookie cutters, kitchen utensils, aprons, oven mitts, utensils, cake pans, rolling pins, flour, a sugar bowl, an egg beater, wooden spoons, measuring cups, measuring spoons, etc. You will need uncooked spaghetti and miniature marshmallows. Ask children to use them to create all kinds of Christmas sculptures. Display their creations. Provide red and green modeling dough. Set the dough in the center of the table and invite children to create different Christmas sculptures together. Provide salt dough. Let children create Christmas sculptures. Set them out to dry and invite children to paint them. Ice sculptures. Set a large block of ice in a bin on a table and invite children to use spoons to scrape it. Jell-O sculpting. Let children manipulate the contents of a bin filled with red and green Jell-O cubes. Let them try to sculpt the Jell-O. Clay sculptures. Give each child a small block of clay and let them sculpt simple Christmas shapes, a pencil holder, a small plate… Let dry. Ecological sculptures. Using recycled items (metal cans, yogurt containers, empty toilet paper rolls, bread ties, etc. ), encourage children to create a Christmas sculpture. Help them hold the items together with hot glue or any other adhesive. You can decide to have them work together to create one large sculpture or each child can sculpt his own. Display their work. Original sculptures. Wet towels and washcloths and hang them outside for a few hours on a cold day (or set them in the freezer). Once they are frozen, show children how they can bend them in every direction to “sculpt” them. Manipulation workshop. Begin by providing modeling dough alone, without any accessories. Show children how they can knead the dough, tear it, flatten it, etc. After a while, add a few accessories to prolong the duration of this workshop. Color exploration workshop. Often, we prevent children from mixing colors of modeling dough. This is a wonderful activity. Give each child two colors of homemade modeling dough and let them manipulate them until the color is uniform. Children enjoy manipulating different objects that can be used to make impressions in modeling dough. With them, experiment with different fabrics such as denim or burlap. The top of a shoe, pinecones, and large stampers are also interesting for this activity. Roll a variety of round objects (ball, rolling pin, etc.) on modeling dough. Add essential oils to your homemade modeling dough to call upon children’s sense of smell throughout this activity. Provide plastic figurines when children are manipulating modeling dough. They will enjoy covering them with dough and using them to make prints. Modeling dough is a great tool that can help children learn to manipulate scissors. Small plastic knives can also be used to cut modeling dough. Fill a few containers with sugar or salt and hide tiny Christmas-related items in them (pinecones, pine needles, red and green pipe cleaners, etc.). Children can use them to create a variety of original structures. Fill a bin with snow and encourage children to use its contents to create different sculptures. 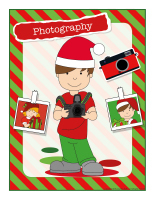 (Open poster-Christmas-Creative workshops-Photography) Print, laminate, and display to identify your workshop. (Open inventory-Christmas-Creative workshops-Photography) Print and insert this sheet in your thematic bin. Use it to inventory the contents of your bin. Add a variety of items such as: toy cameras, photo albums, old pictures, bedsheets and posters (for creating backgrounds), etc. For this workshop, ask parents for pictures from past Christmases. Cut the pictures and glue them on 10 cm x 13 cm pieces of paper. Arrange the pictures in plastic Ziploc bags. You can insert two pictures back to back in each bag. Staple the bags together at the sealed end so you can open them if necessary. Use colorful adhesive tape to cove the staples. Let children manipulate this original photo album. Let children take turns being the group’s photographer. The other children dress up, pretend to apply makeup and find original poses that the photographer can pretend to capture with a toy camera. After a while, invite the photographer to draw his favorite pose. Set a mirror in your dress-up area. Add several elf hats, masks, necklaces, scarves, and other accessories children can use to create unique characters. If possible, photograph your group when they are all dressed up, print the pictures, and display them. A unique creative workshop. (Open photo booth-Christmas) Print the accessories, cut them out, and stick a Christmas-colored drinking straw behind each one. Purchase elf hats, Christmas hair accessories, scarves, glasses, etc. to complete your photo booth. Hang a large piece of cardboard in a corner of your daycare. Add a curtain or create a special Christmas décor. Have fun photographing the children in your group. Simply let them pick and choose among the available items. Print and display the pictures. Use your camera and pretend you are a photographer throughout the day. Take pictures of each child. Print them and use them to create a special photo album representing your group’s daily routine. (Open model-camera) Print the model, trace it on heavy paper and cut it out. Each child will have his own “camera”. Encourage children to use it to capture an activity they enjoyed during the day. (Open model-picture) Print. Invite children to draw the activity they liked most, as if they had photographed it. Christmas frames. (Open Christmas frame) Print for each child. For each one, remove the centre. Add a picture of your group inside each child’s frame. 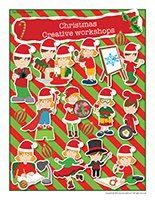 (Open poster-Christmas-Creative workshops-Music) Print, laminate, and display to identify your workshop. (Open inventory-Christmas-Creative workshops-Music) Print and insert this sheet in your thematic bin. Use it to inventory the contents of your bin. Add a variety of items such as: musical instruments, microphones, costumes, a mirror, a tape recorder, songbooks, sheet music, etc. 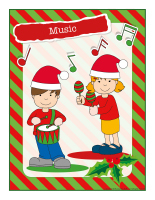 For this creative workshop, ask a child to pick a Christmas song he knows and hum the first line. If that isn’t enough for the others to guess the song, encourage him to continue. You may also be the one who hums a song for your group. For this workshop, invite children to create their very own guitar using an empty shoebox. Cut a hole out of the top of the box (diameter of approx. 8 cm) and put it back on the box. Give each child six rubber bands (different sizes) they can slide over the opening on their box. Show them how they can pinch the rubber bands to create guitar-like sounds. Musical bottles. Use empty soda bottles to create music. Simply hold the bottles in front of your lips and gently blow over the opening. Create different notes by filling the bottles with different levels of water. Make rice-filled maracas. Give each child two empty toilet paper rolls. Seal one end of each roll with adhesive tape. Encourage children to pour rice into each roll so they are half-full. Children can hold their rolls while you seal the opposite ends. Let children draw on their maracas and decorate them as they wish. Use your maracas to create different rhythms. For this workshop you will need eight glass jars. Leave one jar empty and fill the remaining jars with different levels of water. The last jar must be full. Add a few drops of food coloring to the water to make it easier for children to see the water levels. Let children tap the jars with a wooden spoon and a metal spoon to discover different sounds. Line the jars up in order (per water level). Which jar produces the most high-pitched/low-pitched sound? Variation: You could add a variety of different containers, such as a metal can, a cardboard box, and plastic containers to create other types of sounds. Give each child a scarf. Alternate between playing soft and very fast-paced Christmas music. Encourage children to move the scarves to the beat of the music. Show children how they can toss their scarf in the air, spin it around in circles, etc. Invite children to stand in a circle holding their scarves instead of holding hands. They can trade scarves every time the music stops. Christmas dance workshop. Set large Christmas illustrations on the floor. You can cut large Christmas gift bags and use the pictures if you wish. To begin, use one picture less than the number of children in your group. Play Christmas music and encourage children to walk around the daycare. When the music stops, they must quickly find a picture to sit on. The child who does not have a picture to sit on is eliminated. Remove one illustration after each round, until there is only one left. 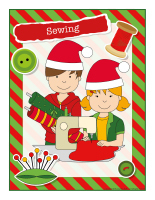 (Open poster-Christmas-Creative workshops-Sewing) Print, laminate, and display to identify your workshop. (Open inventory-Christmas-Creative workshops-Sewing) Print and insert this sheet in your thematic bin. Use it to inventory the contents of your bin. Add a variety of items such as: different colors of thread, empty spools, rulers, chalk, buttons, fabric, elastic, tracing paper, clothing items, a toy sewing machine, plastic needles, sewing kits, Velcro, scissors, zippers, catalogues, thimbles, etc. Organize a sewing workshop. Provide fabric scraps, old clothing items, scissors, and tape measures and let children pretend they are seamstresses. They can shorten clothing items, remove buttons, take seams apart, etc. Elf shoe designer workshop. Give each child two empty shoeboxes and let them use the boxes to design unique elf shoes. Help them punch two series of three or four holes out of each box using a hole-punch. They can thread shoelaces through the holes. Provide a variety of materials children can use to decorate their shoes. Variation: Ask children to bring an old shoe to daycare and let them paint and decorate it. They can add wiggly eyes, feathers, buttons, etc. Display children’s creations on a shelf. A unique creative workshop. Give each child a brown paper bag. Cut three holes out of each child’s bag (two armholes and a hole for their head). Let children decorate their sweater as they wish using ribbon and fabric scraps. Variation: Ask children to bring a plain white t-shirt to daycare and let them decorate it with fabric paint or use transfer paper to transfer a design of their choice to their sweater. Pant design workshop. Cut the back and front of a pair of pants out of a roll of paper for each child. Staple both parts together and cut a slit in the center. Let children draw details on their paper pants. Variation: Ask children to bring an old pair of pants to daycare and let them decorate them with fabric paint, sequins, fabric scraps, etc. Haute couture creative workshop. Divide your group into pairs. One child from each pair will be the model whereas the other child will be the designer. The designers pick clothing items out of your costume bin and use them to dress their model. Plan a quick fashion show. Create scented sachets. Give each child a piece cut out of an old lace curtain. Have them spoon potpourri on the fabric, tie a knot, and add a pretty Christmas ribbon. My Rudolph nose. Give each child one egg carton section. Have them paint it with red poster paint. Punch a hole out of either side of children’s egg carton section and thread a ribbon through so that you can tie both pieces together, behind their head. Invite your little Rudolphs to wear their nose for various activities. 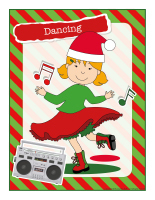 (Open poster-Christmas-Creative workshops-Dancing) Print, laminate, and display to identify your workshop. (Open inventory-Christmas-Creative workshops-Dancing) Print and insert this sheet in your thematic bin. Use it to inventory the contents of your bin. Add a variety of items such as: ribbons, scarves, hula hoops, music, ballet slippers, tap shoes, a mirror, tutus, dresses, hats, etc. Rhythmic ribbon creative workshop. Collect empty paper towel rolls. You will need one per child. Use tissue paper to create rhythmic ribbons. Simply cut strips of tissue paper and staple them to one end of a paper towel roll. Let children decorate the cardboard tube with paint and pieces of colorful paper. Dance costume creative workshop. You will need rope or elastic fabric. For each child, cut a piece long enough to fit around his or her waist. Provide ribbon and strips of tissue paper or construction paper children can use to create their dance costume. They can wear it for dancing activities throughout the week. Creative dancing workshop. Play traditional Christmas music and show children a few line dancing moves. Use cones and different obstacles to create a course within your daycare. Invite children to dance from one end of the course to the other end, going around the various obstacles along the way. Creative movement workshop. Ask children to form a circle and hold hands. Insert a hula hoop between two children and close off the circle once again. The object of the game is for the hula hoop to make it all the way around the circle, but children cannot let go of their friends’ hands. They must find a way! Outdoor aerobics workshop. Play dance music and perform a series of exercises to the beat. Children will enjoy exercising on the grass or snow. Hula hoop creative workshop. Hand each child a colorful hula hoop and let them practice spinning it around their waist. Who can keep it moving the longest? Tap dancing workshop. Invent original tap dance moves with your group. 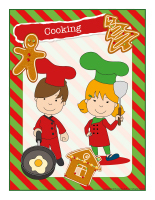 (Open poster-Christmas-Creative workshops-Cooking) Print, laminate, and display to identify your workshop. (Open inventory-Christmas-Creative workshops-Cooking) Print and insert this sheet in your thematic bin. Use it to inventory the contents of your bin. Add a variety of items such as: plastic dishes, plastic utensils, wooden spoons, cutting boards, funnels, sieves, plastic food items, a kitchen scale, refrigerator magnets, felt fruits and vegetables, scented markers and modeling dough, oven mitts, tablecloths, placemats, aprons, chef hats, empty food containers, etc. For this workshop, fill several containers with water. Provide different tools in each one: measuring cups, spoons, funnels, etc. Children will have fun transferring water from one container to the next. Find items normally used in the kitchen that can be used to make Christmas music. Use pots and pans as drums with wooden spoons. Fill jars with water and tap them with metal spoons, etc. This is a simple rhythmic workshop. For this workshop, provide different types of dry pasta that can be threaded on string. Invite children to use them to create unique necklaces. You can color your dry pasta by adding it to a Ziploc bag with a few drops of paint. Shake the contents of the bag and spread it on a cookie sheet to dry. A made-to-measure creative workshop. Fill a bin with rice. Add a few measuring cups, utensils, and containers (different sizes). Set a few empty containers on the table, next to the bin. Place a rubber band around each one to indicate the level to which each container must be filled. Once the containers have all been filled with rice, encourage children to place them in order, from the one containing the least rice to the one containing the most rice. Variation: Fill the bin with dry cereal instead of rice. Bakery role play workshop. Provide utensils, white modeling dough, rolling pins, placemats, bread pans, baker hats, Christmas cookie cutters, etc. Let children pretend they are bakers. At the supermarket role play workshop. You will need a cash register, pretend money, baskets, plastic food items, empty food containers, brown paper bags, store clerk uniforms (shirts, hair nets). Let children pretend they are supermarket employees and customers. Restaurant role play workshop. You will need menus, placemats, tables, chairs, salt and pepper shakers, napkins, utensils, a pencil and a small notebook, plastic food items, dishes, a cash register, and pretend money. Let children pretend they are restaurant employees or customers. Chef role play workshop. Children pretend they are chefs. Make sure you have a chef hat, aprons, casseroles, oven mitts, cookie sheets, etc. for everyone. Claus’ baking workshop. Provide rolling pins, aluminum pie plates, Christmas platters and cookie cutters, Mrs. Claus hats, aprons, white modeling dough (to which you may add cinnamon), baking sheets, spatulas, cake pans. Santa Claus beard. With the children in your group, melt marshmallows in a bowl in the microwave for 30 seconds. Children can take turns stirring. Microwave the marshmallows for 10 seconds more. Set the melted marshmallows in the center of the table. Using a Popsicle stick, they can spread the marshmallows on a piece of red construction paper. Add wiggly eyes and a red pompom for a nose. Sweet reindeer workshop. Give each child a brown pipe cleaner and a candy cane. Help them glue two wiggly eyes on the rounded part of the candy cane. Tie a bow with a pretty ribbon. Bake sugar cookies with your group. Children will love measuring, calculating, pouring, etc. What’s more, they can use fun Christmas cookie cutters to make fun shapes. 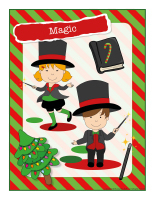 (Open poster-Christmas-Creative workshops-Magic) Print, laminate, and display to identify your workshop. 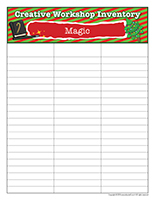 (Open inventory-Christmas-Creative workshops-Magic) Print and insert this sheet in your thematic bin. Use it to inventory the contents of your bin. Add a variety of items such as: magician hats, magic wands, stuffed rabbits, star-shaped cookie cutters for cutting stars out of construction paper, etc. Children will enjoy sticking stars on your daycare walls, floor, under tables, toys, etc. Design an obstacle course that children must complete in the dark. Set different items that children can collect along the course. Try to find items related to magic such as a wand, a magician’s hat, a rabbit, a bird, a playing card, etc. Tell children your obstacle course was designed for elves. During this creative workshop, organize a treasure hunt where children must find the elves’ magic powder. Plan a creative workshop with your parachute. Children can hide under it to disappear like a rabbit in a magician’s hat. Organize activities in the dark with flashlights. You can also provide glowsticks. Teach children simple magic or juggling tricks. Plan a creative workshop that involves manipulation bins (feathers, sand, dry cereal). Insert laminated stars and invite children to search for them. Name the color of each star. Set a variety of objects on the table (a star, a magic wand, etc.). Add Christmas-related items such as a candy cane, a Christmas figurine, etc. Children observe the items for one minute. Cover them with a dark blanket and remove one or two things. Pull the blanket away and have children identify the missing object(s). For this creative workshop, set several items on a table (nail, paperclip, money, rubber band, aluminum piece, crayon, plastic block, lipstick, etc.). Set a magnet next to each item, one at a time to see which ones are attracted to it. Help children understand that metals are attracted to magnets. Magical Christmas ornament. Give each child a Styrofoam ball and help them cut it in half. Encourage each child to paint and decorate one half of a ball. 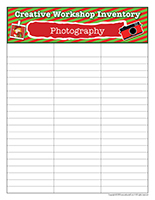 Photograph each child in front of a Christmas-themed background. Print the pictures and let each child glue a picture on his half-Styrofoam ball. Varnish the ornaments. Insert a pipe cleaner in each child’s ornament so they can be hung in your Christmas tree. Christmas snow globes. Give each child a leakproof jar (ex. jam). Have them use modeling dough to represent a Christmas figurine, small enough to be inserted in the jar. Help them glue the figurine on the lid of their jar using hot glue. Fill the jar with water, adding water until it is a little more than half full. Add red and green glitter. Put the lid on the jar and seal it with hot glue. Turn the jar over (lid on the bottom). Let children shake their snow globe. Magic snow. Mix 1 cup of water with 2 cups of cornstarch. The mixture is ready when it no longer sticks to the sides of the bowl. It will seem to be liquid, but if you hit it, it won’t splash (it is liquid when it’s not under pressure and solid when under pressure). Give a small amount of the mixture to each child and encourage them to form a magic ball. They will quickly realize that as soon as they stop manipulating the preparation, it becomes liquid. Have children wear aprons for this activity, even if cornstarch does not stain. Simply brush children’s clothes off when you are done.